As part of the collective punishment policy adopted by the Israeli forces against the Palestinian civilians accused of carrying out attacks against Israeli soldiers or/and settlers, on Wednesday, 16 August 2017, the Israeli forces demolished a house belonging to ‘Omer ‘Abdel Jalil al-‘Abed in Kobar village, northwest of Ramallah. The Palestinian Center for Human Rights (PCHR) accordingly condemns this new crime, which is added to the series of Israeli crimes committed in the occupied Palestinian territory (oPt). PCHR also emphasizes that the crime is part of the Israeli forces’ collective punishment policy against innocent Palestinians in violation of Article 33 of the Fourth Geneva Convention that prohibits collective penalties and reprisals against protected persons and their property. PCHR calls upon the international community to offer protection to the civilians in the oPt and ensure the application of the aforementioned convention. According to PCHR’s investigations, at approximately 01:30 on Wednesday, 16 August 2017, Israeli forces backed by 20 military vehicles and accompanied with a digger and bulldozer moved into Kobar village, northwest of Ramallah. They then surrounded a 2-storey house belonging to the family of ‘Omer ‘Abdel Jalil al-‘Abed. The house was built on an area of 180 square meters, sheltering 7 members, including a girl with special needs. The Israeli vehicles immediately destroyed the walls of the ground floor, which was inhabited, while the second floor, which was under-construction, sustained severe damage. Meanwhile, the Palestine TV crew was covering the house demolition, so the Israeli soldiers deliberately fired rubber-coated metal bullets at the Palestine TV photographer, Mohammed Radi. As a result, he was hit with a bullet to the nose and then taken by an ambulance belonging to the Palestinian Red Crescent Society (PRCS) to Palestine Medical Complex in Ramallah for medical treatment. Local sources in the Complex said that the bullet fractured his nose. It should be mentioned that the abovementioned civilian has been arrested by the Israeli forces since 21 July 2017 on grounds of carrying out a stab attack in “Helmish” settlement, northwest of Ramallah that resulted in the killing of 3 settlers. The Israeli forces have also arrested his parents; 2 brothers, Munir and Khalid; and his uncle, Ibrahim al-‘Abed, accusing them of having prior knowledge of the attack. 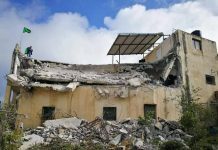 PCHR condemns the crime of demolishing the abovementioned houses that falls within the collective punishment policy adopted by the Israeli forces against the Palestinian civilians. PCHR reminds that this policy is internationally prohibited according to Article 33 of the Fourth Geneva Convention, which states that: “No protected person may be punished for an offense he or she has not personally committed. Collective penalties and likewise all measures of intimidation or of terrorism are prohibited. Pillage is prohibited. Reprisals against protected persons and their property are prohibited.” Therefore, PCHR reiterates its call upon the international community to take immediate action to put an end to the Israeli crimes. PCHR also reiterates its call upon the High Contracting Parties to the 1949 Fourth Geneva Convention to fulfill their obligations under Article 1; i.e., to respect and ensure respect for the Convention in all circumstances and their obligations under Article 146 to prosecute persons alleged to commit grave breaches of the Fourth Geneva Convention. These grave breaches constitute war crimes under Article 147 of the same Convention and Protocol (I) Additional to the Geneva Conventions regarding the guarantee of Palestinian civilians’ right to protection in the oPt.